To coincide with the Progressive Palaeontology 2017 conference taking place, we thought it might be worth providing a quick look at the recent paleontology research in PeerJ. 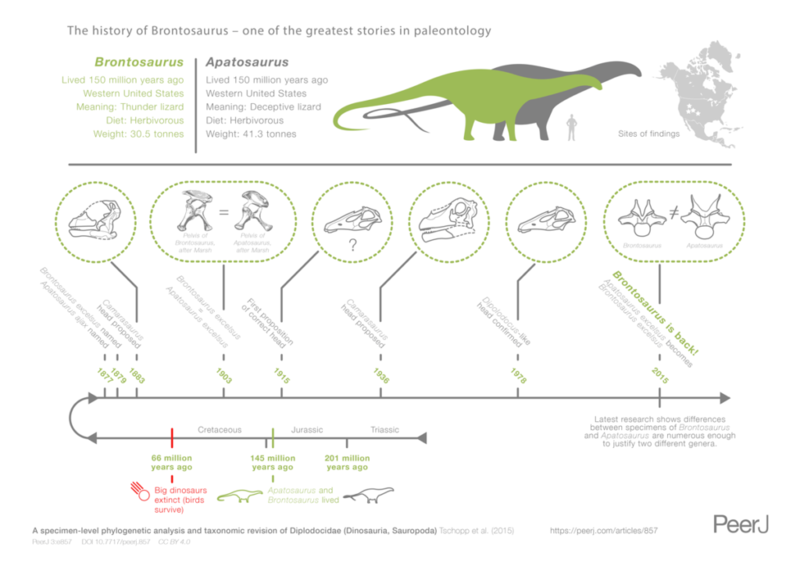 Over the last few months, PeerJ has peer-reviewed and published a broad range of paleontology articles already viewed by thousands of readers around the world. At PeerJ we are a strong supporter of facilitating the rapid communication of scientific findings. Many of the paleontology articles below were first shared via PeerJ Preprints – our preprint server for biology, medicine and computer science and we are thrilled to see such widespread support amongst paleontologists for PeerJ. Through our prestigious editorial board and community of committed reviewers, we offer a high-quality, constructive peer review process (with optional open peer review) and a wide-reaching and engaged audience for your research. And our community membership model provides a low-cost option for publishing open access. More info on getting started on your submission here. This paper published last week looks at Ceratopsids (“horned dinosaurs”) known to be have been widespread through western North America and Asia. This research reports on a novel discovery of a tooth from Ceratopsidae in eastern North America. The authors report the discovery and also describe the hypothesis that ceratopsids dispersed into eastern North America near the end of the Cretaceous, presumably after the two halves of North America were reunited following the retreat of the Western Interior Seaway. Researchers share findings on South American megafauna during the Pleistocene. This study used 19th and early 20th century fossils of the Pampean region from various Argentinian and European museums to detect carnivore marks and determine ecological relationships. After analysing the carnivore marks, the findings indicate that ursids, canids and potentially felids fed upon these large bones suggesting multiple taxa hunting / scavenging. This study helps to further the understanding of the community ecology within the region. Still in South America but this time looking at pterosaurs, and in particular the Anhanguerids. 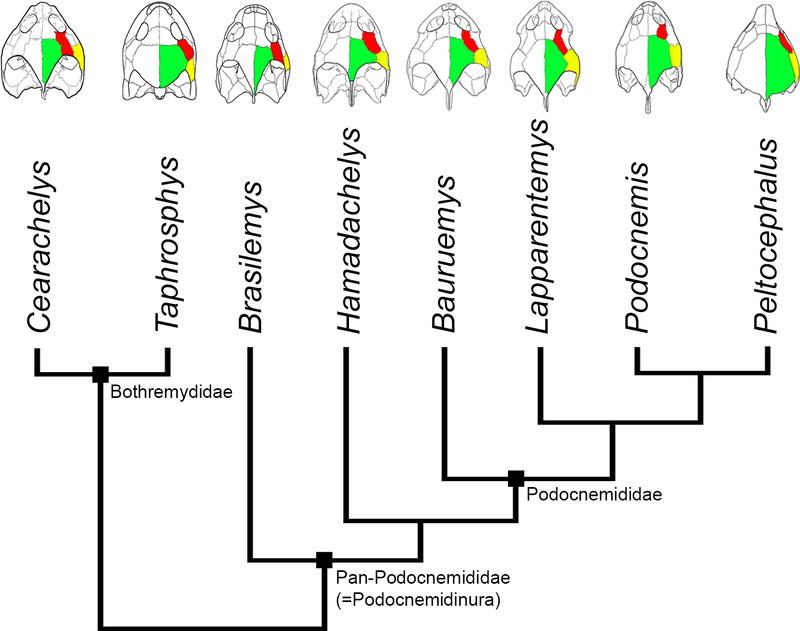 Pinheiro et al describe in detail the skulls of the most complete specimens and review the diversity of the Anhanguerid group and suggest that Anhanguerids are much less diverse than previously thought. A sauropod specimen discovered in France in 1934 known as the “Damparis sauropod” has been re-described as Vouivria damparisensis and incorporated into a revised phylogenetic data matrix. 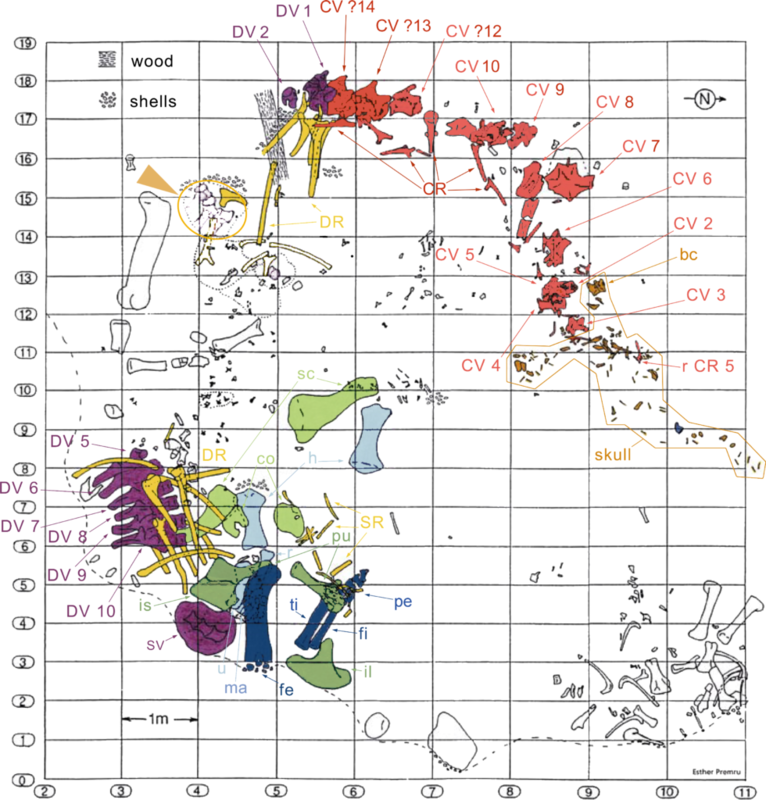 This study confirms that Vouvria is the oldest known titanosauriform. The study demonstrates the value of phylogenetic analyses and uncovers the variation between taxa. Mannion et al argue that where there is morphological variation, this should be captured, rather than ignored. 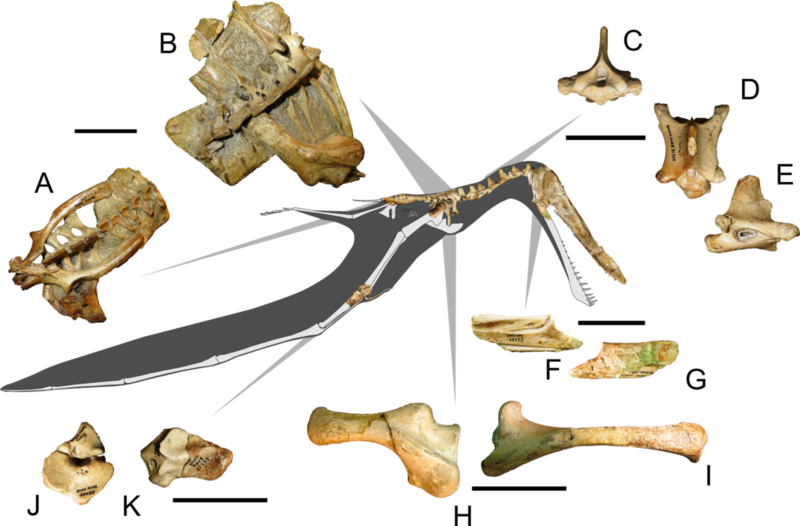 This paper features more sauropods with a newly described species in the Galeamopus genus from a sexually mature individual. The study also highlights the importance of the development of lamination in the vertebrae as an indicator of the specimen’s age. Investigating the evolutionary lineage of the crocodilians, this study using µCT data virtually reconstruct the endocranial anatomy of Pelagosaurus typus. Typus is an early thalattosuchian with traits pertinent to both the Telosauoidea and the Metriorhynchoidea major subgroups placing typus in an informative phylogenetic position. One of the key findings of this study is the description of an expansion of the nasal cavity which correlates with enlargements of the salt glands. The results show some remarkable physiological and sensory adaptations to marine life in and early crocodylomorph. In order to gain a better understanding of the evolution of therapsid groups this study looked at the braincase anatomy of two gorgonopsian specimens. Using propagation phase contrast synchrotron micro-computes tomography they identified a separate ossification between the “parasphenoid” and the basioccipital and actually reinterpreted the “paraphenoid” as the co-ossification of the dermal parasphenoid and the endochondral basisphenoid. These findings suggest that the morphology of the brain endocast has more in common with reptilian endocast than other neotherapsids. Finally we wrap up with Bauruemys elegans a freshwater side necked turtle from the late cretaceous which is important as its phylogenetic position places it as a stem Podocnemididae. This study carried out ANOVA testing on 29 linear measurement from 21 skulls combined with PCA with 27 of these measurements as well as other analysies. With a previously established hypothesis that all fossils found of elgans have been from a single population the study concluded that the skull variation is likely due to differences in feeding habits. When and why did the giant mega-toothed shark Otodus megalodon become extinct?